Syria: "Nobody Here Was Prepared for This"
MSF project manager Loïc Jaeger describes the situation in Syria, where he spent two months working in an MSF hospital. 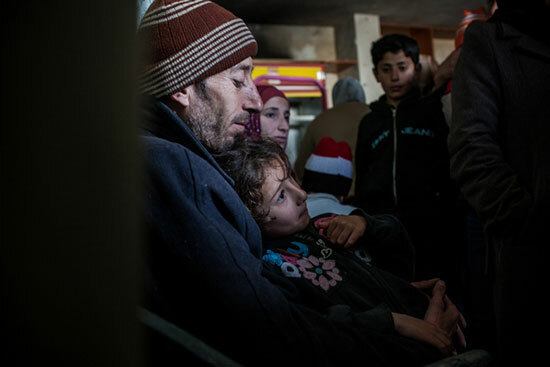 A father and his daughter wait in MSF's mobile clinic to see a doctor in Northern Syria. Doctors Without Borders/Médecins Sans Frontières (MSF) project manager Loïc Jaeger just spent two months in Syria in one of three covert hospitals that MSF manages there. Here he describes the humanitarian situation and MSF’s response. Two years have passed since the beginning of the conflict in Syria. What is the current situation in the country? The situation is dire; the needs are massive and the overall humanitarian response is extremely limited. In general, the few humanitarian actors that are working in the north of Syria are mostly focusing on surgery. But the health care needs are immense and far more extensive. Before the war Syrians were leading a normal life with a relatively high standard of living. In the region where we work, near the Turkish border, there are lots of lovely summer houses that used to be used for holidays by people living in the big cities. The children used to go to school, and water flowed from the taps . . . But for months now the electricity has stopped functioning, there is no running water, and people have been coping with the bitter cold winter with no heating. People have gone back to wood stoves; in every house you see a hole drilled into the wall to install a chimney. Just 20 kilometers [about 12.5 miles] from our hospital there is a city of 150,000 inhabitants with several hospitals, including a public hospital with state-of-the-art medical equipment—just like I’d expect in a hospital back home in France. But the frontline of the war lies between our location and this hospital, so it has become inaccessible for most people. And gasoline, which was previously subsidized by the state, is now unaffordable, which means people can’t afford to travel even short distances. The civilian population is completely caught out. People here are not used to conflict and so they don’t know the mechanisms of survival in difficult conditions. Nobody here was prepared for this. What is the MSF team doing? Surgical operations are an important part of our work because civilians are caught up in bombings virtually every day. I remember talking to a man who was completely distraught; his wife had been disfigured by a mortar that had exploded near her. She was just hanging out the washing, but in the wrong place at the wrong time. We treat around one seriously wounded person per day, but when a bomb falls in a place with lots of people we treat up to 30. When there’s a big battle, we treat 80. But it’s not just surgery. As more and more people fled away from the frontlines of the fighting, we started running an outpatient clinic that enabled us to identify other needs, such as care for chronic diseases. In the big city nearby, for example, people are desperate to escape, but it’s not easy. Many people slip out, pretending they are just off to visit some relatives, on foot or by taxi, taking nothing with them. At first these people settled in houses abandoned by their owners, but there are more and more tented camps in the mountains. Because it is so cold, we immediately started donating blankets as a first step to helping these people. Bit by bit we have been extending our activities, especially in the areas of maternal health and mental health. What are the difficulties for pregnant women in Syria today? Before, a pregnant woman could get in a car and drive to a modern, fully equipped hospital in 20 or 30 minutes. Most women would do the standard three ultrasound scans during pregnancy and then give birth in the hands of specialists. When we first arrived in the region, women giving birth were totally out of options; mostly they give birth at home or tried to cross the border on foot or by tractor. So we started organizing antenatal consultations as part of our mobile clinics and we opened a maternity service in our hospital. As we’ve expanded our mobile clinic reach, the number of births in the hospital has gone from two per week to two per day. It’s strange to have women giving birth just ten meters from the area where we’re treating serious wounds or where we’re brought the bodies of dead or dying children. But it’s good, a sort of relief that there’s new life too. That’s one of the strengths of our project. What was the level of demand for mental health? This is a war, and people are living in a very tense environment, in a climate of general suspicion and mistrust. Many have lost their homes, their loved ones . . . many people have panic attacks. Children are no longer going to school, they’re constantly surrounded by armed men and war wounded. This is their new reality. In our outpatient consultations, we see many distraught mothers who speak about their children’s psychosomatic problems. When we raised the prospect of launching mental health activities, community leaders, religious leaders, and opposition leaders were all very supportive. Family conflicts are erupting and people can’t understand why; there are children who suddenly have strange behavior, such as bed wetting. Children don’t play with marbles here anymore; they play with Kalashnikov cartridges. What are the concerns for the coming months? The winter here is cold, so for now movements are quite restricted; it seems that people move only if they are certain they’ll find a space in a house or a tent. With the arrival of spring, travel will resume and more people will come from further away. There are probably going to be lots more tented camps. Villages that used to count 50 households already have 500 or more households living there. There could soon be a need for camps of 1,000 tents. As we move into the dry summer, there’s going to be a problem of water supply and sanitation. And if the conflict continues with this disregard for civilian safety, we will keep seeing regular influxes of civilian victims of bombing. What solidarity exists within the population? You don’t see the major humanitarian organizations that we’d usually expect to see in a crisis like this. But there is considerable support from the Syrian diaspora living abroad. Above all, the solidarity between people here is enormous; people are very willing to share their houses or their food with others, asking nothing in return. In the village where we live there’s no electricity, and therefore no running water. The generator had broken down and it was impossible to find replacement parts. A neighbor offered his generator and a water pump for the use of the whole village. And there are lots of people who are willing to help with treatment of the wounded. In another village there’s a dentist who’s been doing basic surgery, a man who’s revised his basic first-aid training from fifteen years ago and is providing nursing care for sick people . . . the generosity of spirit is remarkable.